This Cashiers NC home for sale, located at 584 New Trillium Way, is a gem. The private setting boasts lake and mountain views, a perfect mountain getaway! This 4 bedroom, 4 bath home is situated on a lot that is .71 acres in size. This Highlands NC home is high on the mountain across from a private island on Lake Glenville. The location has the best of both worlds, the feeling of a private retreat yet close to all the family-friendly Trillium Links and Lake Club amenities. 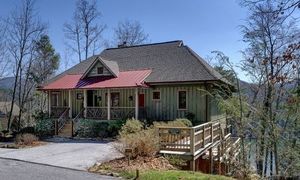 This Cashiers NC property offers easy lake access and proximity to great hiking trails. hike with the kids on several on-property hiking trails. The home is thoughtfully designed, taking full advantage of the fabulous views. Each of the bedrooms and the great room boast French doors offering easy access to the outdoors. The large covered decks on each level add an extra 1,200 square feet of outdoor living space, useable in any weather. The main floor and the lower level are separately accessible and lockable. In addition there is an optional lock-out door between the levels. Combined the two floors create one large 4BR/4BA home with interior access. As a result the rental options are terrific. Rent the home as a 4BR/4BA during the peak season or as 2BR/2BA during the slower seasons. Deeded access to Lake Glenville provides access to boat rentals and family swim outings. In addition the 18-hole championship golf course at Trillium Links and Lake Club is one of the best in the area. Trillium also offers two outdoor and three indoor clay tennis courts. Trillium is truly where families belong. Contact our team at Berkshire Hathaway HomeServices Meadows Mountain Realty today to learn more about 584 New Trillium Way. We welcome the opportunity to help you conduct a successful Cashiers NC property search. Let our knowledge and experiencer serves as your guide to the market and the area. We look forward to locating the ideal Cashiers NC home for sale for you and your family to enjoy for years to come.